As you may well know, it’s difficult when you are working within a budget to find one ensemble that is capable of playing the many different kinds of music that your people want to hear and enjoy. Having spent a combined total of seventy-five years in this aspect of the music business, the BIG THRILL may be just the answer to your entertainment woes. 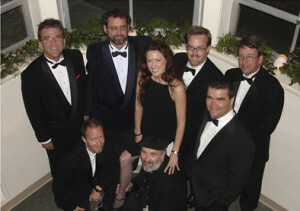 Comprised of seven talented instrumentalists and a lovely, silken-voiced singer, the BIG THRILL can provide your function with hours of memorable entertainment, ranging from the toe-tapping standards of the 30’s and 40’s through the pulsating rhythm and blues beat of the “Big Chill” era, and culminating with today’s top contemporary sounds.